How serious is the norovirus outbreak? 7 questions with Mark Dowell, M.D. It’s often called the stomach flu or food poisoning. It can ruin a business’ reputation and strip the cheer from the company Christmas party. It is the scourge of daycares, nursing homes and classrooms. Stomach flu and other illnesses rarely wait for your scheduled appointment. Our primary care providers can see you without an appointment for sore throats, fevers, sinus or ear infections and other symptoms that need quick medical attention, but don't require a trip to the Emergency Room. No appointment necessary, insurance accepted. It is norovirus, and according to a press release from the Wyoming Department of Health, it is spreading through Casper and Cheyenne. Below, Mark Dowell, M.D., medical director of infection control at Wyoming Medical Center, explains this virus that is actively seeking your upper gastrointestinal tract. Norovirus is a virus that is found everywhere in the world. It is able to live on surfaces and in food, and it can survive pretty well. It loves human gastrointestinal tracts, especially the upper tract. It can cause diarrhea, but a lot of times it leads to nausea, vomiting and abdominal cramps. There’s not much fever, but it can literally bring you to your knees. It lasts anywhere from 12 to 36 hours. 2. Is this what people refer to as food poisoning? It can be food poisoning, and it often is. But it doesn’t have to be. Sometimes it is just spread person to person, usually through a lack of hand washing. 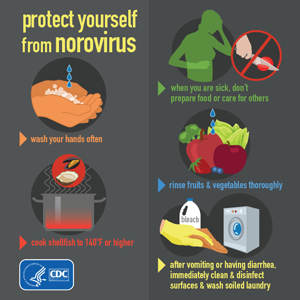 Sometimes the food itself is contaminated by norovirus, but a lot of times it spreads because the person preparing the food had it and didn’t wash their hands appropriately. That’s what happened with the Golden Corral here in town a few years ago. The people preparing food inoculated the virus into the chocolate fountain, into the liver and onions and other places. So when people ate it, they got sick. It does not take much of the virus to make you ill. There are a lot of different strains of it, and you don’t always have protection from one strain to the next. If you did, you’d get this once as a kid and you’d never get sick again. There are a lot of other bacteria and viruses that can cause food poisoning. But this is one that is really contagious. Norovirus is also what the public refers to as stomach flu. 3. How widespread is this outbreak? It’s pretty widespread. Currently, it’s spreading through nursing homes, assisted care centers, schools and other places where people are in close contact with each other. What happens is, you get a strain of norovirus in your community, and it makes a number of people ill, and then enough of the population is protected that the strain goes away. But then another strain is introduced at some point. While you can get it from contaminated food, you can also get it from what I call the saliva exchange program. And that’s how you get a lot of these kinds of infections spreading through schools and day cares. Day cares are extremely worried about outbreaks of norovirus because you get little tiny ones who can get dehydrated. 4. What are you seeing in Casper? There is a lot of norovirus in Casper, and it’s affecting all different populations. You know, it’s Christmas party season, so I’m just waiting for multiple groups to get sick. A few years ago, there was a medical group that had their Christmas party at a local restaurant. They all got sick. We know it was norovirus because we sent in a sample to the state lab and they confirmed it. It kind of ruined the Christmas spirit for some of those people. This is usually not a deadly infection at all. It can be more severe in people who have a lot of underlying health problems, but in people who are generally healthy, it’s very self-limited. The last time I had it, I want to say 10 years ago, I went home, slept it off and was back at work the next day. I’ve never heard of anyone dying of norovirus. 6. When should parents seek medical help? If your kid is sick, and you put your kid on the world famous BRAT diet (bananas, rice, applesauce, toast) and make sure they keep their fluids in, you probably won’t need to do anything. If you cannot stop children from vomiting, you need to call your primary care provider and see about a suppository to help. Rarely does a child truly dehydrate from norovirus. It can happen, but it is not common. The virus is self-limited enough that unless you are producing so much fluid during diarrhea and vomiting, you’re not going to become so dehydrated that you won’t recover. You’ll know when your kid is over it when he goes to the refrigerator or pantry that starts eating junk food. Hunks of poatato chips, a left over hotdog, and they do absolutely fine. That kid’s body tells them that they are over it. There are no antiviruses available, no vaccines. They’ve looked at a vaccine, but I think we need to put our research money elsewhere. This is a self-limited infection that runs its course pretty quickly, and I don’t think those dollars would be well spent. We need to work on other vaccines. Some of the best medicine for this virus is to go to sleep. Frankly, there are anti-nausea medicines that you can get from your provider if you need it. Just don’t immediately start eating a burger and fries when your appetite comes back. The only real treatment is prevention. This is a perfect opportunity to teach your kids how to wash their hands and use the hand gel. You don’t want to make your friends sick, even though your friends may have been the ones to have made you sick.